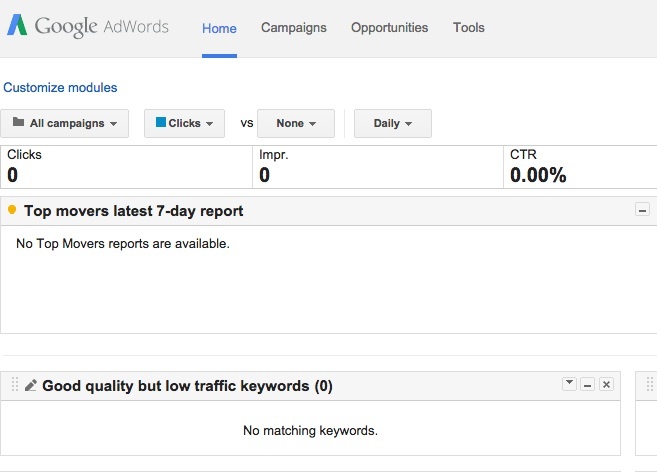 Google Keyword Planner is a useful free tool. Discover how effective the keywords that you are targeting really are. A keyword or keyword phrase is the word or phrase that people are using as a search word or term to find certain goods, services or information on the web. If you have a good idea which search terms your potential visitors are using, then by making sure that you have those words in your web-copy (website text) you can help Google direct the right people to your website. The way Google works is by sending search robots to scan over your website text. The robots look to see what words you are using to find out what kind of service or information you are offering. That way they know when and where to list your business in the Google results page listings. 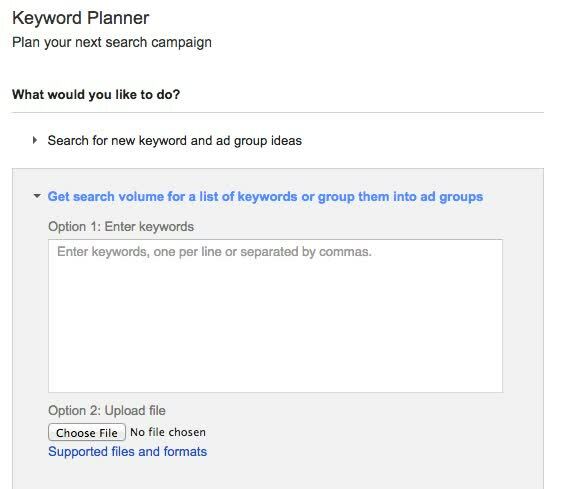 You can make Google feel more confident that you are the person their search requester is looking for, by ensuring that you are using appropriate and effective search words…otherwise known as keywords. A good way to do this is guess. Well you do know your customers don’t you? You know a bit about how they think, and you know what words they use when they ask you for things. Of course, Google knows a lot about these people too. Google records all of the searches that are made and makes those statistics available to you for free. Click on Sign in or Create an account at the top right of the page. The sign up process only takes a moment or two. Once you are an account holder, you will be taken to the page pictured below. Click on ‘Tools’ in the top menu bar. A drop down will appear including the menu item ‘Keyword Planner’. That’s the one you want. Don’t be put off that the website is geared towards selling Adwords campaigns. You are very welcome to get information here about popular keywords for your service or offering, whether you are planning to use Adwords or not. Finding the comparative value of keywords can help you write good, Google friendly copy for your website. If you are just starting up a business, you may want to consider popular keywords or search terms for your service or product because you want to use a keyword or phrase in the title of your business and/or your url (website address). 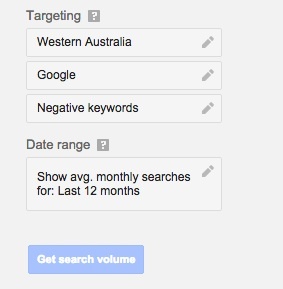 Once at the Keyword Planner Page, select item two in the bullet list – ‘Get search volume for a list of keywords’. Put in a list of keywords that you are considering. That means a list of words that you think people might be entering into Google in order to search for you and your industry competitors. Select the location you want to target. You can put in multiple locations. You can select a country, city or region. When you are ready just click the blue ‘Get search volume” button. This brings up a results page with a table customised to your search. The image below shows a table a generated using possible search terms used by people looking for a WA based website services provider, such as Open Copy. What I’m interested in, is just the first column showing average monthly searches for each of the terms that I entered. If you click on the icon in the bottom left corner of each of the search volume cells, a graph pops up showing the search volumes per month for the last year. 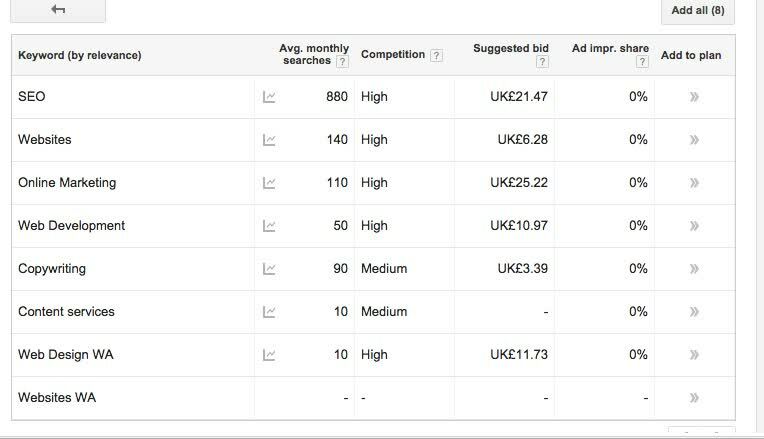 To see the search volume for different or more keywords just click the ‘Modify search’ button in the top right of the page. As a copywriter specialising in webcopy for business, I use Keyword Planner at the planning stage of a project. It helps me to identify and analyse the effectiveness of potential keywords. In order to make copy as search engine friendly as possible I am mindful about using keywords through out the website. It also pays to know that the search engine robots pay particular notice to keywords that are used in headlines, or that are placed in bold. If I am writing copy for an accommodation provider, I will look at the different words that people may use to search for their holiday home, villa, chalet, cottage, house or accommodation. I will then look at the different variables of accommodation words, coupled with the location, as I know from personal experience that this is how I search for my holiday accommodation. Also it’s logical. I also look at descriptive words that people may be searching for. This may include, luxury, deluxe, five star, eco, budget, family friendly, secluded, or pet-friendly. Once you have a list of keywords that look like they are worth prioritising, you can aim to use these in your web-copy. It is very important, however, that the words and phrases integrate seamlessly and unobtrusively into the text. Getting people to your website is Step 1. Step 2 is getting them to trust and like your brand. Step 2 will be in jeopardy if your copy doesn’t sound reasonably natural and conversational. Google is also good at spotting if a website is using keywords excessively or inappropriately. They do this using very clever robots – and sometimes even humans – to assess your website. I find a good rule of thumb is be aware of, but not lead by, your target list of keywords when writing copy. A specialist web copy writer or SEO expert can help you gain useful insights and develop strategies for an effective keywords campaign. However, if you are willing to up-skill and take the time, you can do some very worthwhile research yourself on Keyword Planner. Open Copy provide support training and consultation services for all your DIY efforts. We also offer competitive Done-For-You service for the tasks that you feel you need to off-load. If there are any online marketing decisions or tasks you want some free help with, you can leave a query on the comment section below or on our Facebook Page, https://www.facebook.com/opencopy. We will endeavour to return your comment asap with some free advise or tips.